if you want to create documents that will awe your readers or use features in Ms word, beyond the basic knowledge depth of Ms word, such that people will think you used a specialized software, this program is for you. Now, with this Virtual Ms word training program, you do not need to attend those short crash training programs that will make you spend more money, leave your home or office. 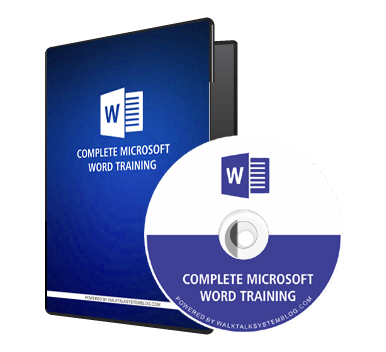 With this kind of training model, you can take your Ms word knowledge to a greater depth – Right from the comfort of your home or office. If you want to take an assessment of yourself if you know Microsoft Word, stop right now, go to the contents of this Virtual Microsoft Word Program and take a look at the contents. If you can beat your chest that you have a thorough coverage of all the contents such that, you can create a professional looking document, then this course is not for you. However, if you are using Ms Word in creating documents on a regular basis but you would have to as ask ” How-to-Questions”, go through the Ms Word Help, just to find out how to add spices to your documents, this program is for you. Also, if you have learnt Ms Word before but have forgotten how to use some of its commands, menus etc; or probably, you learnt Word 97-2003, but you want to keep abreast of the new features in Ms word, this program is for you. More also, if you want to create documents that will awe your readers or use features in Ms word, beyond the basic knowledge depth of Ms word, such that people will think you used a specialized software, this program is for you. You do not need to spend more money to sharpen your Ms word skills. This is the main reason this program was prepared for you. Without Ms Word, It will be difficult to prepare great reports and presentations. if you hate preparing reports, please do not learn Ms word. Module 1 – Introduction To Ms Word:- Here, you are given a presentation of what you can do with Ms word. This module comprises only 1 video. Module 2 – Navigating The Ms Word Work Space: Here, you will be given a tour guide to the Ms Word application. You will be taken through the Ribbon, Ribbon groups, Galleries and dialog box launchers. This module comprises only 1 video. Module 3 – Getting Started With Ms Word: This module teaches you how to start typing in Ms word, ways you can create your documents, using installed templates etc. You have only 1 document on this module. Module 4 – Editing In Ms Word:- Here, you will learn how to copy, paste, using find and replace commands, undo and redo actions, adding more commands to the Quick Access tool bar. This module comprises only 1 video. Module 5 – Formatting In Ms Word: This Module has 2 videos which comprises Text Formatting and Paragraph Formatting. You will learn how to use all the formatting commands to format your paragraphs and text. you will also learn how to use the format painter to copy formatting, apply bullets, use custom bullets, paragraph alignment, use paragraph borders, make body text perfectly fits on the centre of a page. Module 6 – Managing Document Pagination: Here, you will learn about page break, Using orphan/Widow control. This Module contains 1 video. Module 7 – Inserting Page Break And Section Break :- Here, you will learn how to apply different types of breaks to your documents such as page break, document break and also identify the point at which a page or section breaks. This module contains 1 video. Module 8 – Setting Up Your Page:- Here, you will explore the page set up options which you can find in the Page Layout tab. This includes the use of margins, page orientation, Using Headers and Footers, custom-formatting of page numbers. Also, you will learn how to create different headers for different pages of the same document. This module contains 1 video. Module 9 – Adding End Notes And Footnotes:- Here, you will learn how to add footnotes and endnotes, convert footnotes to endnotes and vice versa. You will also learn how to click on a word on your documents which automatically takes you to its footnotes or endnotes. This module contains 1 video. Module 10 – Creating A Columnar Document:- On this module, you will learn how to create a columnar document like you have on a newspaper and magazine. You will also learn how to integrate with footnotes or endnotes. You will also learn how to remove section breaks. This module contains 1 video. Module 11 :- Adding Styles And Creating Automatic Table Of Contents:- Here, you will learn when and how to apply styles to your documents. You will also learn how to create your own style, use styles to create a consistent formatting feel for your document headers. More also, you will learn how to customize existing styles, use style sets and using styles to create automatic Table of Contents. Finally, you will learn how to use Table of contents to jump to a section that the content refers to. This module contains 2 videos. Module 12 :- Creating Tables On Your Documents:- Here, you will learn how to draw a table, Use Insert table command, or use the Quick command to insert table. Also you will learn how to use table design tools to format tables, change table structure as well as perform calculations, using Functions on your tables in Ms word. There are 4 videos on this module. This module contains 4 videos. Module 13 :- Inserting Objects On Your Document:- This module contains 7 videos that teache you how to add object such as pictures, clip Arts, shapes, smartArt graphics and charts and screenshots. You will also learn how to use object contextual tabs to format and arrange objects. This includes using the tools to properly align text around objects, Create special effects on objects, remove picture background etc. More also, you will learn how to add caption to pictures and map a text within you document that can be used to navigate to an object when you click the text. Module 14 :- Creating Links An References:- This module contains 7 videos that teach you how to creak links such as hyperlinks, bookmarks, Cross References, using a text box, word Art and symbols as well as Quick parts. Also, we shall explore other Insert tab commands to ensure that the use of the commands are dealt with exhaustively – these commands include, drop caps, Signature lines, built-in-functions. Module 15 :- Exploring The Page Layout Tab:- This module comprises 4 videos that teaches you how to add apply themes, Insert and customize watermarks, add page background colours as well as page borders. Module 16 :- Using The Mailing Tab In Ms Word:- This module comprises 4 videos that teach you how to create envelopes and labels in Ms word, use the Mail Merge feature to automate a single document (such as letters, certificates etc) that can be sent to many people with different identities – email, addresses, names etc, without manually typing their identifies one by one. With this, you will learn how you can pool data from Excel and Ms Access and automatically create certificates or letters without having to type separate letters for each individuals, even if you have to send to 1,000 recipients. Module 17 :- Checking Your Documents For Errors:- This module comprises 7 videos that teach you how to use the Autocorrect feature in Word, check document for spellings and grammar, use the Thesaurus command to proof your documents, translate your document to another language, track changes, compare revised documents with original as well as things you need to do to prepare and share your documents. Module 18 :- Exploring The View Tab In Ms Word:- This module comprises 3 videos that takes you on a tour on the View Tab In Ms Word. Here, you will learn the basic viewing options and what purpose they serve. You will also learn how to use the Navigation pane to view and navigate your documents. Also, you will learn how to use the Zoom feature, display multiple pages at a times, view multiple areas of one document at a time. etc. Module 19 :- Finalizing Your Document:- This module comprises 5 videos that teach you two ways of password-protecting your document, make custom protection, using the Restrict Editing Command, and preparing your documents for printing. Finally, you will learn how to use Macros in Ms word to automate formatting of your documents, create your own command button that you can use on Ms word. More also, you will be taken to the back stage of Ms word and learn how to customize the way Ms word works for you.